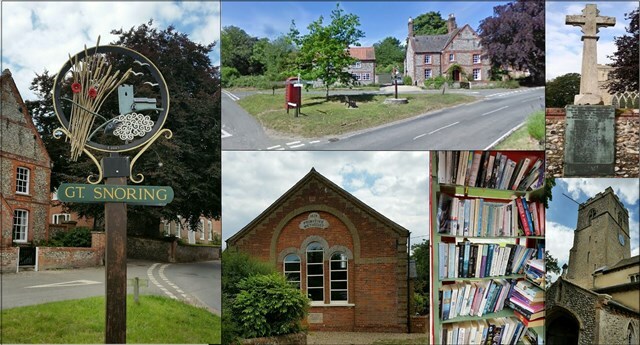 Great Snoring is a small rural village in North Norfolk on the river Stiffkey and is 2 miles south east of Little Walsingham and 6 miles south of the sea at Wells next to Sea. The village is recorded in the Domesday Book as Snaringa. It is referred to as Snoryng Magna in some records until the 1500s, and in the 1450s there is reference to the village as Mekyl-snoryng. The new village sign was unveiled in 2011 and replaced the old sign which it was thought did not reflect village life. It has two curved lines in the lower half symbolising the village’s position in the Stiffkey Valley, while a sheaf of corn, with poppies among the ears, and a woolly sheep stand for the main activities of Great Snoring today. The village church is also featured, while gulls fly over the whole design. The church is dedicated to Saint Mary the Virgin. The exterior is of chiefly Perpendicular style although there are some earlier elements and interior fixtures from the 12th to the 18th centuries. The church was Grade 1 listed in 1959. There was also a Weslyan Chapel which was active between 1875-1892, and a Primitive Methodist Chapel which held services from 1874-1973. It is now a private residence. The Methodist chapel was part of the Fakenham and Wells Methodist Circuit. Adjacent to the Anglican churchyard is the two-storey brick and terracotta Old Rectory. Built in the late 15th or early 16th century as a manor house for the Shelton family, it was extended between the 17th and 19th centuries. The house was Grade II* listed in 1951 John Betjeman described the house as “a Tudor palace, with moulded autumn-colour brick and elaborate chimney stacks"
On 12 April 1836 Walsingham Poor Law Union was formed, and a new Walsingham Union workhouse was built at Great Snoring in the same year to accommodate up to 250 inmates. Four accommodation wings were joined to a central supervisory area, allowing segregation of different categories of inmate. Areas between the wings were used as exercise space. Workshops and service buildings around the edge gave the overall site an octagonal shape, and to the east of the site there was a chapel. After the closure of the workhouse, the buildings had various uses: as a smallpox hospital in the 1930s; by the Civil Defence in the 1950s; and most recently, plans to convert the building into 35 flats were approved in 1961. But no conversion was carried out and the buildings have now been demolished. The telephone kiosk on the small triangular green was granted listed building status in 1989 and was decommissioned in 2011 The red iconic box was turned into a small ‘library’ for the use of the village in September 2013. You are looking for a small camouflaged tube. Please bring your own pen. If anybody would like to expand this series please do. I would just ask that you let Smokeypugs; know first so they can keep track of the Village Sign numbers and names to avoid duplication.